I first became acquainted with Angelica gigas in the pages of A Year at North Hill , some fourteen years ago. I’ve wanted to grow it ever since then, but acquiring it proved problematic. The information I found in those pre-internet days said that it did not like to be moved; start it from seed where you want it to grow. And the seed must be fresh for successful germination, meaning, if you get it from a vendor or seed exchange in January, it’s already too late. At least it was for me. I got my hands on seed several times, but never succeeded in germinating any. Seeds are forming on the first angelica bloom. I despaired of ever growing this plant in my garden, though being hardy to USDA Zone 4 and favoring moist soil, it seemed ideally suited to my conditions. I planted those seedlings around a first-year Actaea simplex ‘Black Negligee,’ an inspired decision, I must say. 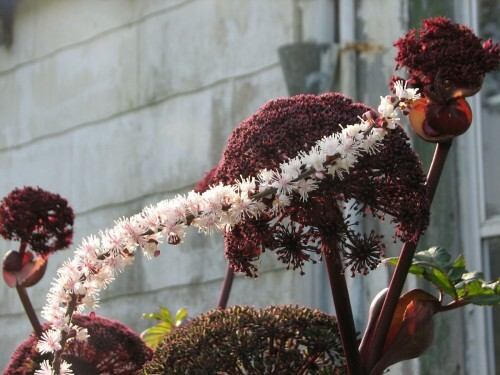 As you can see in the top photo, the purple-leaved foliage of the actaea (commonly known as bugbane, and formerly known as Cimicifuga simplex) echoes the dramatic maroon of the angelica’s flowers. The bugbane’s bottlebrush flowers contrast in shape with the angelica’s umbels, while the delicate pink flush of the former complements the deep plum of the latter. And they are both big plants, though the angelica is a bigger plant. It works on many levels, just like my other inspired deep purple combo, the Lauren’s Grape poppy paired with ‘Dark Towers’ penstemon. I’m on a roll, wouldn’t you say? Wow, that looks wonderful. I bet you get compliments on this all the time. 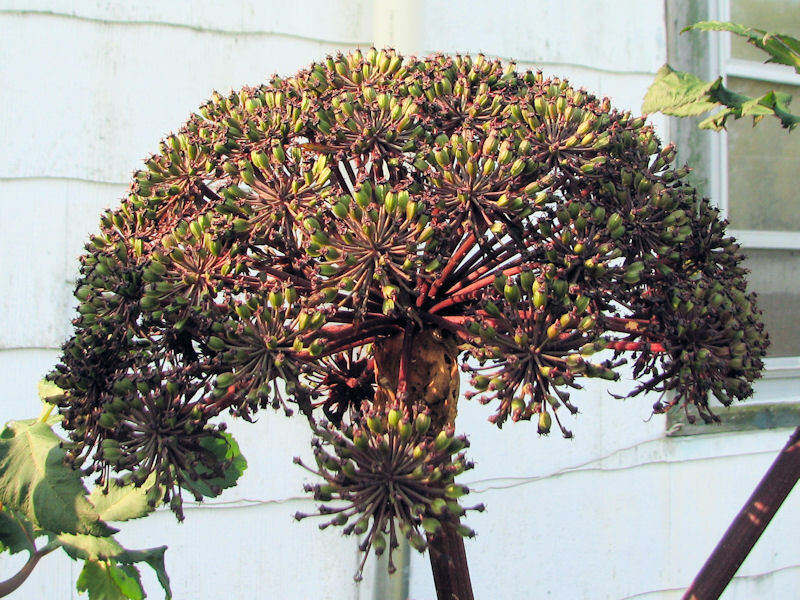 I think I may have to see if there’s any way I can get a hold of an Angelica for my own yard now. Again, another combination that I covet, I am becoming a terrible person always lusting after someone elses brilliant ideas. I already have the (what will always be to me ) cimicifuga, now I just need to track down some generous person with the angelica. .-= Deborah at Kilbourne Grove´s last blog ..Labour Day! (and I did) =-. That is a fabulous combination! Congratulations on growing the Angelica! A friend from Maryland sent me seeds years ago … I wonder if I still have them? .-= Cindy, MCOK´s last blog ..Through the Garden Gate: Monday, September 7th =-. Covet! I love that Actaea so much but it’s even better with the Angelica. Inspiring! I know you’ve seen Black Negligee at Cornell, Lynn. Someone around there must sell it. Yowza – that is a gorgeous combination, Kathy – and the setting works, too. Those intense colors look great against the pale background of your frame house. I hope Margaret’s angelicas settle in to stay! .-= Annie in Austin´s last blog ..Looking for Julie and Julia =-. Margaret has had hers for years. I think they are quite settled in, Annie. .-= Dee/reddirtramblings´s last blog ..Tulips, Daffodils and Word Games =-. I think I will do some of both: sow some seed where I want plants, and let it self-sow, too. .-= Mr. McGregor’s Daughter´s last blog ..It’s…* The Incredible Shrinking MeMe! =-. Kathy, I have nominated you for a MeMe Award. If you are up to it, the details and rules are at my blog. WOW! the head of the angelica looks amazing. And the combo with the bugbane is lovely. .-= MA´s last blog ..Dear Friends and Gardeners, Week 28: It’s a wrap! =-. Yes, you are – and I love it. I have also been searching for seeds for Angelica Gigas without any luck. Guess best bet is to find at a nursery next spring?